WASHINGTON (Sept. 09, 2011) -- Family members, coworkers, and friends of those killed on 9/11 from the Office of the Administrative Assistant to the Secretary of the Army gathered near the Pentagon Memorial Friday to place "resilience ribbons" on benches dedicated to those lost. Before a sea of umbrellas and under a steady rain, Joyce E. Morrow, the administrative assistant to the secretary of the Army, spoke to the ceremony attendees just two days in advance of the 10th anniversary of the attack. 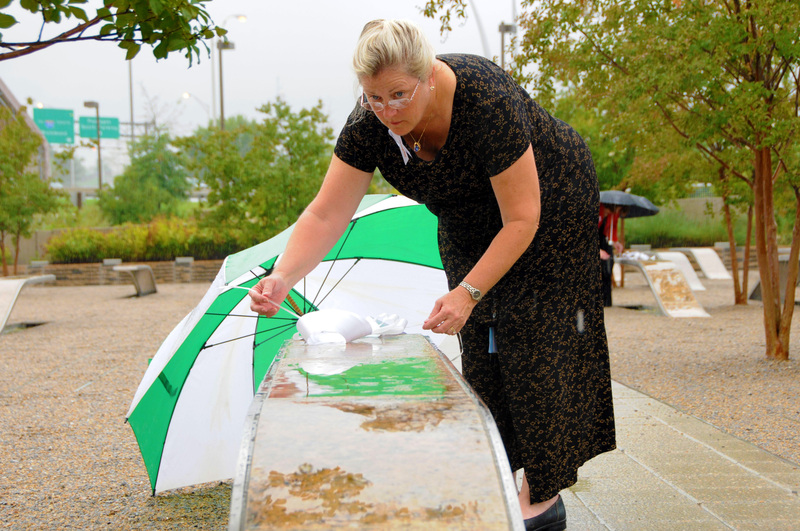 Family members, coworkers, and friends of those killed on 9/11 from the Office of the Administrative Assistant to the Secretary of the Army gathered near the Pentagon Memorial Friday to place "resilience ribbons" on benches dedicated to those lost. "The 40 individuals we remember today had many roles: husbands and wives, fathers and mothers, sons and daughters, friends and coworkers," Morrow said. "Your presence here today helps remind us how significant, and how special those 40 individuals were." At the time of the attack, it was J. B. Hudson who served as the administrative assistant. He stood to address the crowd, some who were there that day and who still work for the office. "As the members of the OAA family grieved their loss, they rose to the many challenges, and met every one of them in an exemplary manner," Hudson said. "Nearly a decade later, 9/11 is no less painful, and the threat to this American experiment in democracy, any less real. From those events, one very profound truth rises above all others: our nation is blessed with an incredible number of patriots who meet every challenge to our way of life with unbelievable grace and absolute determination. Today, I am blessed to be among the finest of those patriots." After Morrow and Hudson spoke, the names of those killed were read aloud, and a representative for each rose to collect a ribbon to be placed on their memorial bench in the Pentagon Memorial. "These ribbons represent the trinity of yesterday, today and tomorrow," Morrow said. "We will always have our sacred memories of yesterday. Some may still be difficult to revisit. Other memories may cause us moments of reflection, and still others may remind us of the good times we shared. Even in our darkest moments, we find hope and faith. Together we move forward in the spirit of healing and strength." After the 40 names were read, ceremony participants moved to the Pentagon Memorial to place the ribbons there on the benches. "Today was very important, to remember all those that were lost, but also to kind of celebrate the strength, the resiliency and the resolve of the survivors, the family members and the coworkers," Morrow said. "Being the 10th anniversary of the attack, it was a special moment to be able to reflect."